Loomis squash continues to grow in strength and success each year. Returning players create a foundation for our program while new players promote strong competition for the team. We believe in a consistent program message; our squads are coached with strong communication between the JV and varsity teams and with a true program mentality. Players coming in with little to no experience have the chance to work their way up the ladder and succeed at the varsity level as their experience grows. The Loomis squash program philosophy centers on the core concept that squash is both fun and challenging. The goal is for the boys to hone their skills daily, take fitness seriously, compete hard, and have fun. We see squash as a lifelong sport, where the skills of the game and the understanding of its flow and strategies create lasting friendships and an enduring enjoyment of the game. 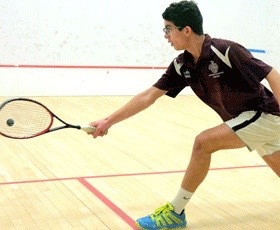 The boys varsity squash team defeated Kent 5-2 in the season opener last weekend. Wyatt French '13, a senior at Middlebury College, finished his collegiate men's squash career this winter ranked 36th nationally. The boys and girls squash teams competed in the New England Prep School Athletic Conference (NEPSAC) championships over the weekend. The boys took home third place in Division B while the girls came in fourth.